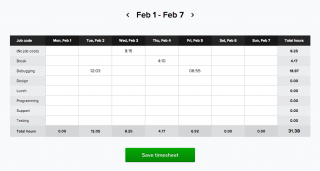 Home >manual time entry >UPDATE: Manual time entry – Added ability to enter hours and minutes. We updated the Manual time entry section in Clockspot so that you can enter your work hours in hours and minutes. It used to be that if you wanted to enter 8 hours 20 minutes, you’d have to enter 8.3333 hours. Clockspot would then convert the hours you entered into the nearest hours + minutes. Now you can simply enter 8:20 to specify 8 hours and 20 minutes. Let us know what you guys think! If you have any suggestions, we’d love to get your feedback.